Governor Andrew M. Cuomo today outlined four major federal cuts, totaling more than $21.2 billion annually, that are part of policies targeted to directly hurt New York State- devastating state and local governments, straining public and not-for-profit hospitals, and jeopardizing quality healthcare for more than 3 million New Yorkers. Moreover, the cuts to New York State are disproportionate to the rest of the country - even as New York is the number one state contributor to the federal government, sending $48 billion more to Washington each year than is returned. Given the devastating impact of the federal government's reckless policies, Governor Cuomo mobilized a coalition to work with New York's Congressional Delegation to fight back and stop the cuts. "These devastating federal cuts are a dagger in the heart to New York State, attacking needy healthcare patients, stripping away healthcare from children, forcing cuts on stressed hospitals and local governments and ultimately raising taxes on New Yorkers," Governor Cuomo said. "We will not stand idly by while the federal government targets middle and working class New Yorkers -- we must speak up now, mobilize to stop these devastating cuts and stand up for our New York values." The Graham-Cassidy bill was Congress' latest attempt to repeal the Affordable Care Act. The bill was projected to cost New York State a total of $40-60 billion by 2025 - more than any other state in the nation. The bill also jeopardized 1.2 million health care jobs in New York State, penalized states that expanded Medicaid and was written to end health care support totally in 2026. Thanks to a national opposition campaign, New York's Congressional delegation and others raising their voices across the country, the Graham-Cassidy bill failed last week. However, Congress has made it clear that there will be further attempts to repeal the Affordable Care Act, which would be devastating to New York's health care industry, economy and ability to provide care. Congress failed to rescind Disproportionate Share Hospital payment cuts that became effective on October 1, reducing critical federal funding that reimburses hospitals through the Medicaid program for uncompensated health care costs. These cuts will decimate New York's hospitals and fall hardest on its public and safety net hospitals that are already strained and serve the neediest patient populations. Compared to other states, New York State is hit the hardest. The State receives 16 percent of the total cut, amounting to $2.6 billion. California and New Jersey each receive a $1.2 billion cut, and Texas receives a $1 billion cut. As the State already faces a $4 billion deficit, it cannot absorb this additional liability. Under current state law for DSH distribution, funding first goes to all private hospitals for uninsured expenses up to the current legal cap, approximately 25 percent. Additional funding goes to public hospitals if a local government puts up matching funds. Lastly, funding goes to all public hospitals for up to 100 percent of the Medicaid and uninsured losses. Public hospitals are owned by local governments who must address their economic reality. These are federal cuts to local governments and their hospitals. The State is in the same position with SUNY hospitals. State law says that if a Medicaid cut over $850 million takes place, the new plan is subject to legislation. KPMG has been retained as a financial adviser to advise on a detailed financial analysis of each hospital and their overall condition and to determine a strategy for how to best absorb the impact of next year's $1.1 billion hit. The State will also reconvene the successful Medicaid Redesign Team. The New York Congressional delegation says that the cut will be restored by December 31. If this does not happen, the Governor has repeatedly said it may require a special session of the legislature to rework the healthcare budget. In the interim, the State is working with public hospitals to manage cash flow and protect patient care. The federal Congress failed to reauthorize the Children's Health Insurance Program, an innovative health insurance program that was pioneered by New York State, under Governor Mario Cuomo, before becoming a national program. CHIP insures children in families at up to 400 percent of the federal poverty level, covering those who are otherwise not eligible for Medicaid. Congress's failure to reauthorize CHIP by September 30, 2017, jeopardizes coverage for 9 million children across the United States, including 330,000 in New York. The program provides comprehensive health care coverage for children, including coverage for routine checkups, immunizations, doctor visits, prescriptions, dental and vision care, inpatient and outpatient hospital care, laboratory and x-ray services and emergency services. New York State's CHIP program is primarily funded by the federal government. The program in New York costs approximately $1.3 billion. New York State stands to lose close to $1.1 billion in federal CHIP funding if the program is not reauthorized. To continue CHIP without this federal funding would cost New York State $1 billion, on top of all other cuts. The proposed federal tax plan eliminates the deduction for State and local taxes, costing New York $17.5 billion annually. Instead of ensuring cuts to all New York taxpayers, the federal tax plan will create a scenario in which 3.3 million New Yorkers - the vast majority of whom are middle class - will be double taxed. Today, Governor Cuomo reiterated New York's plan to file a lawsuit if this provision passes on the basis of double taxation. 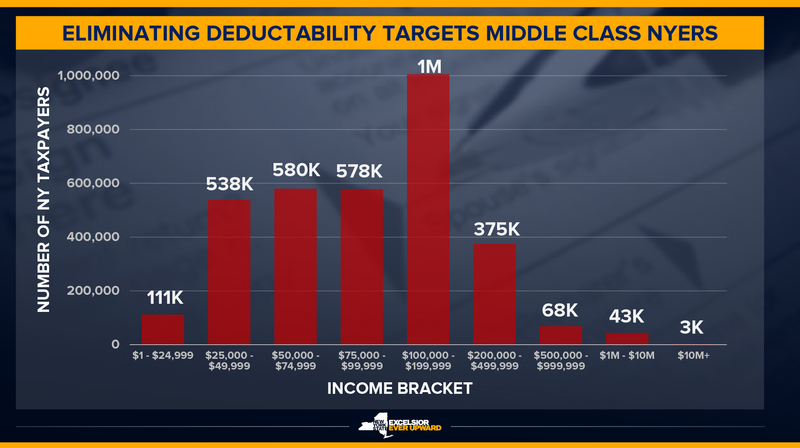 Eliminating deductibility targets middle class New Yorkers - a breakdown of the impact by income bracket is available here. New York State is again hit hardest of any state by the federal tax plan's inclusion of this provision, according to data from the Tax Foundation. Just five states - California, Illinois, New Jersey, Massachusetts, and New York - make up 50 percent of the revenues required to support the federal tax plan. The federal government's tax plan deliberately makes New York less competitive than other states to attract people and businesses.